Philippa A Taylor – Contemporary Potter. My exhibition work is an ‘unfolding story’ of my pursuit to perfectly balance the qualities of contemporary porcelain, its whiteness and purity with notes of vintage 70’s stoneware, gritty clays and oxide washes. Natural Forms- Inspired by botanical and aquatic inspired protrusions. Artefacts & Archeology- Forms and mark making of Ancient Pots. Textile Design- Knots, weave, loops and stitches. Modernist Design-The union of hard and soft. She studied a B.A Craft in 1994 at Monash University and completed her honours in 1997. Her thesis was based on the research into high fired Celedon glazes on stoneware vessels decorated with hand carved botanical motifs. Now with a passion for the British ceramic tradition, Scandinavian designs and Japanese decorating techniques, her work is both functional and sculptural. 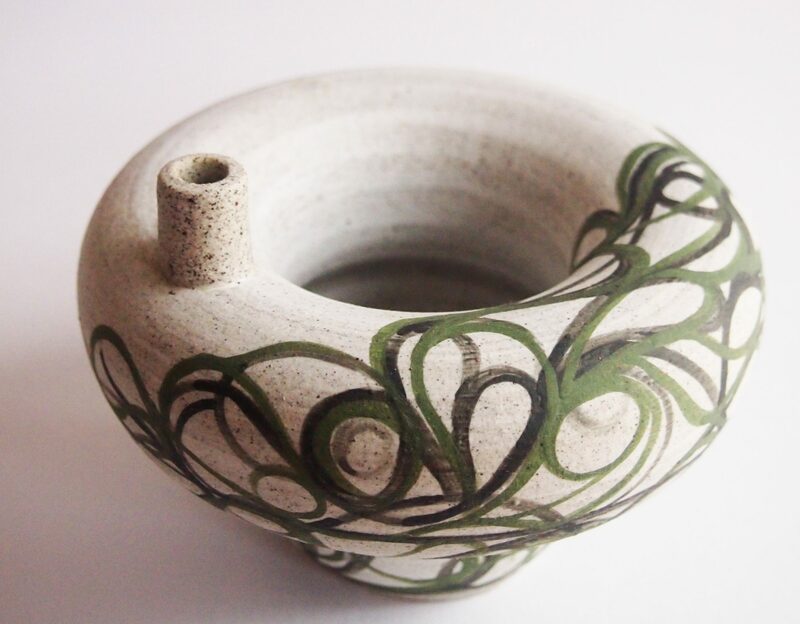 Combining her traditional understandings with a contemporary ceramics approach. ‘Seether’, ceramic tassel, stoneware & cotton, 2018.